The Pfitzner TMC-82 (sold as Teletron Condor in the Netherlands) is a compact VHF PMR transceiver. 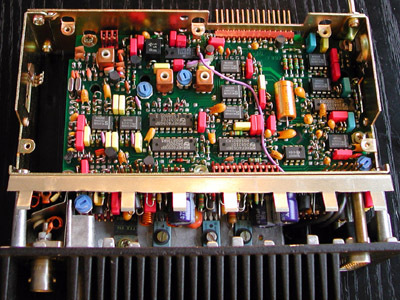 Being available in the surplus circuit, this transceiver has found its way to radio amateurs and serious listeners alike. Only a small modification is needed to make the unfiltered baseband signal available to the outside world. According to Pfitzner's service documentation, the unfiltered audio can be found at pin 8 of J13, a TBA120S FM detector. This IC is mounted on the middle PCB of the TMC82. The IC can be reached by removing the processor PCB. The processor board is the one at the top of the TMC-82, with the component side visible. 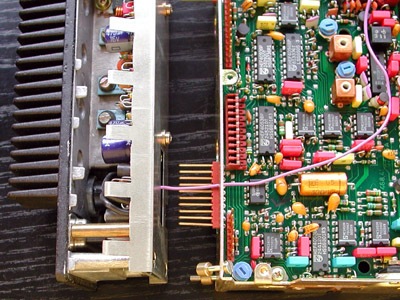 A 10 k resistor is mounted on pin 8 of the TBA120. The other lead of the resistor is connected to the outside world. There is no need to mount an additional connector to the set for the discriminator signal. Pin 5 of the 15 pin D connector at the back of the transceiver is unused (spare). 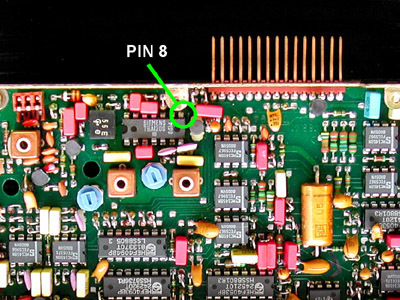 It is perfectly possible to use this pin to connect the unfiltered audio from the discriminator IC. To do this, the back part of the TMC-82 needs to be removed. By releasing four screws, this module can be removed. By removing another two screws, the metal shield can be taken away and the PCB becomes visible. 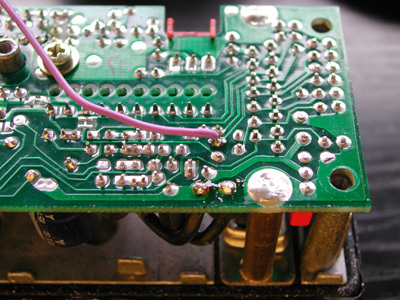 The wire coming from the 10 k resistor is connected to the free solder pad that is connected with pin 5 of the D connector. The wire can be routed just above the PCB connector that connects the back module of the set with the middle PCB.